Snobby Tours Travelblog: SANTA FE, NEW MEXICO -- The oldest capital city in North America and the oldest European community west of the Mississippi River. SANTA FE, NEW MEXICO -- The oldest capital city in North America and the oldest European community west of the Mississippi River. 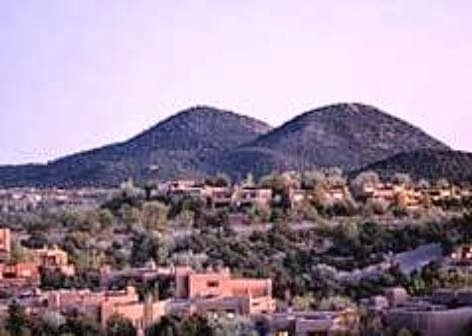 Settled in the early 17th Century by Franciscan missionaries, as well as Spanish military and governmental officials, life in Early Santa Fe was often filled with conflict. The indigenous Native Americans, the Pueblos, who lived in the region, had a population at that time of approximately 100,000 people speaking nine different languages and living in an estimated 70 villages. Although what was to become the town of Santa Fe was inhabited by the Spanish as early as 1607, the conquistador Don Pedro de Peralta is credited with truly settling it around 1610, when Santa Fe was established by the Spanish Governor as the capital of New Mexico. At the time, Santa Fe was still part of the empire of "New Spain". Santa Fe's site originally had been occupied by a number of Pueblo villages dating back to between 1050 and 1150 A.D. Archeologists who have studied the site generally agree that these "pre-Spanish conquest" villages had been abandoned by the 14th Century, at least 200 years before the Spanish arrived, although Pueblos were still living in the region. In 1540, the conquistador Don Francisco Vasques de Coronado, first claimed the "Kingdom of New Mexico" for the Spanish Crown, but it was not until 1598 that the first Governor-General of New Mexico, Don Juan de Onate, established New Mexico's capital at San Juan Pueblo located 25-miles north of present-day Santa Fe. Upon the retirement of Onate in 1609, Don Pedro de Peralta was appointed Governor-General. Peralta and his men mapped out the plan for Santa Fe to be located at the base of the Sangre de Cristo Mountains, on the site of an ancient Pueblo ruin named "Kaupoge", which translated means "place of shell beads near the water", and in 1610, moved the capital to present-day Santa Fe. In 1610, the oldest continuously operating "public building" in America, the Palace of the Governors, was built on the plaza, and still stands at that location. Santa Fe quickly became the "hub of commerce" between New Mexico and the country of Mexico to its south. However, over the next 70 years, tensions increased between the Pueblos of the region and the Spanish who sought to convert the Pueblos to Christianity. Finally, in 1680, the Pueblos revolted. At the time, there were around 2,500 Spanish colonists in New Mexico, 400 of which were killed by the Pueblos, and the remaining colonists driven back in Mexico. 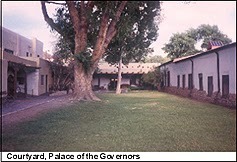 The only building in Santa Fe which was not sacked and burned by the Pueblos was the Palace of the Governors. For the next 12 years, the Pueblos occupied Santa Fe; however, in 1692, Don Diego de Vargas re-conquered the region and entered Santa Fe after a bloodless siege. The Santa Fe "Fiesta", which is celebrated in early September of each year, was established in 1712 to commemorate the Spanish re-conquest of New Mexico in the summer of 1692. This "Fiesta" is now the oldest community celebration in the US.